With Chi-Chi’s house being our central gathering place, we ate dinner in Cotui most nights. So I only got a chance to talk to Fina in the mornings at breakfast. She liked to sit, hands folded under her chin, at the end of the table, asking me questions. Her pose and her smile reminded me of the mother of one of the families I lived with in Costa Rica, the woman who made me feel welcomed and loved when I struggled to learn the language and adjust to working in a refugee camp. 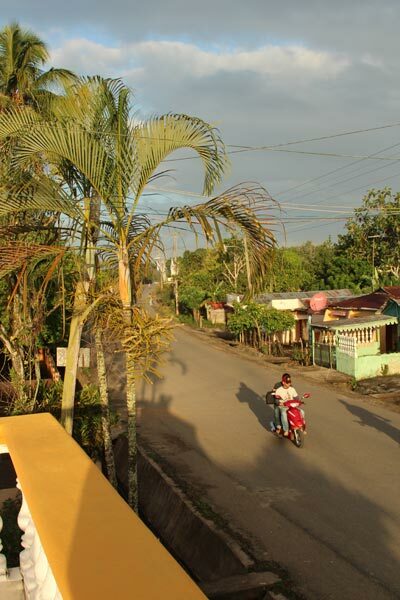 Maguaca, with one of the ever-present "motos." One time, when I complained about not getting letters from my *real* family back home – this was in the days of blue tissue-thin aerograms – she reminded me that I had a family in Costa Rica who loved me, and that I should be happy. After you’ve had that kind of experience, it’s difficult to settle for just being a tourist. I’ve felt frustrated in Mexico and Puerto Rico at the difficulty of getting beneath the surface of the culture. A group such as DR Projects, or the relief and development organization I worked for out of college, provides a tremendous gateway to get to know people, and to understand a little about their lives. So staying with a host family was one of the things I most looked forward to about this trip. And although our room was loud, and hot, and cramped, we really could’t have asked for a better family to live with. Our itinerary said that on Saturday night we were to eat dinner with our host families, but because Aristides’ car was being used, we ate at Chi-Chi’s, and made it out to Maguaca almost two hours late. Knowing how important food is to Latin American culture, I felt terrible when Tom and I arrived, full from our dinner in Cotui, and saw a table groaning with food, waiting for us. We tried to make it up to Fina and Gambo on Sunday morning, rising early to attend mass with them. Smoothing over guest/host relations was only part of my desire to attend mass, however. I wanted to see more of the town than just the crossroads and the colmado. And I wanted to sit still a little bit after a week spent driving into the hills to perform clinics, fighting through some minor stomach issues, and touring clinics and hospitals. I enjoyed walking to and from the church with the crowd of townspeople on the town’s main road, which was almost deserted at 7:00 on Sunday morning. I also enjoyed meeting a few of Gambo and Fina’s neighbors. Our hosts took obvious pleasure in introducing us, and I was gratified to see the town as people, instead of as just a collection of sleep-disturbing noises. Mass was over at 7:45, and by 8:00 we had returned to the house to have breakfast. Fina had reheated the previous night’s dinner, which we ate with gusto, and a little guilt. She accompanied the pork and yucca with tostones – fried plantain fritters – which I had told her earlier in the week were my favorite. And just as it was nice to sit in the church and watch the early-morning sun create a halo around the priest as he gave the homily, it was nice to finally be able to sit and chat with Fina for more than 15 minutes. I have found it difficult this week to switch between languages, as I often served as one of our interpreters. So talking for a full hour with Fina gave my Spanish a flow I had been missing all week, and I reveled in it, moving beyond basic questions and observations to asking Fina about her life in more detail. Fina grew up across the street, in a tiny yellow house that still stands. 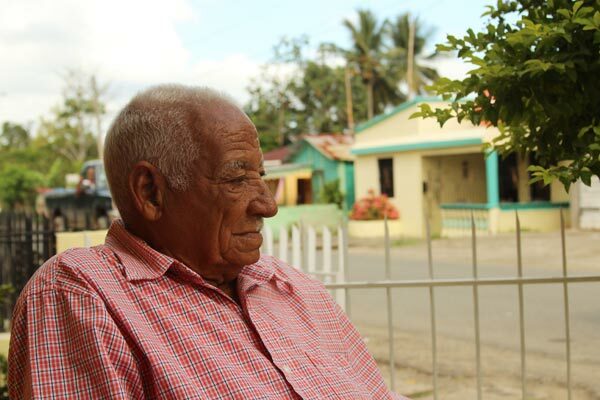 Gambo grew up in Cotui, and he would pass through Maguaca on his way to the fields his family owned. They spotted each other, she said with a grin, and that was that. Gambo is in his 80s but looks ten years younger. She was 22 when they got married, in 1969. He was 18 years older than her, which would make him around 83 years old. He looks ten years younger, and has a grizzled, bemused way about him that I found appealing. One morning, when I asked him how he was, he said, “I’m alive.” On Saturday evening, when we arrived too late for dinner, Fina had just finished giving Gambo a manicure and a shave. He sat smiling in their kitchen, wearing his Sunday shirt, and I wondered what the Spanish word would be for dapper. He definitely looked dapper. After Sunday breakfast, we walked across the street to see Gambo’s garage, where he stores the cacao he buys from neighboring farms. It’s right next door to Fina’s old house. Together, they lifted the metal gate door to the garage, and Gambo showed me sacks of cacao, encouraging me to take a handful of the beans. They smelled lightly fermented, spicy, fungal, of the earth. We walked up the rough concrete stairs on the side of the building – ducking under bare electrical wires strung between the house and the garage – to see where Gambo’s workers dry the cacao beans on the concrete roof on warm, sunny days. It takes three days to dry the beans, he said, and the workers turn them several times with rakes to hasten the process. 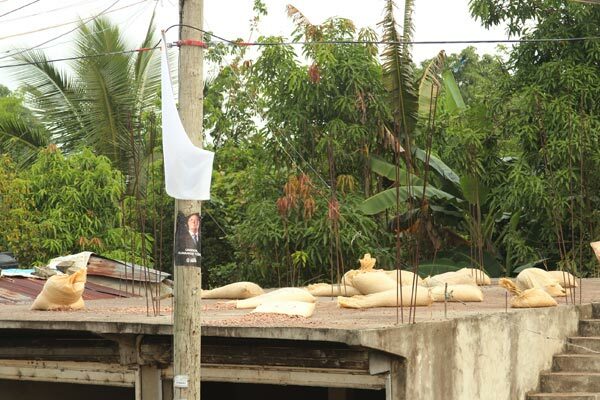 Sacks of cacao on the roof of the garage, waiting to be dried in the sun. He explained that at one time, they had planned to build their home above the garage. Clusters of rusted rebar poked head-height out of the concrete, a method I recognized from Mexico: build what you can with the money you have, and extend the rebar in anticipation of a second floor, even if it never comes to pass. We walked back across the street, and Tom took their photograph in front of their house. Like the children in the villages, they laughed to see themselves on the digital camera’s rear display. Aristides beeped to signal his arrival, and emerged from his blue Mitsubishi Montero with a yell. Although he must be nearing 70, he and the other Dominican men who shuttled us around hollered like teenagers, a loud, “Oyyyyyyee” to announce one’s presence. 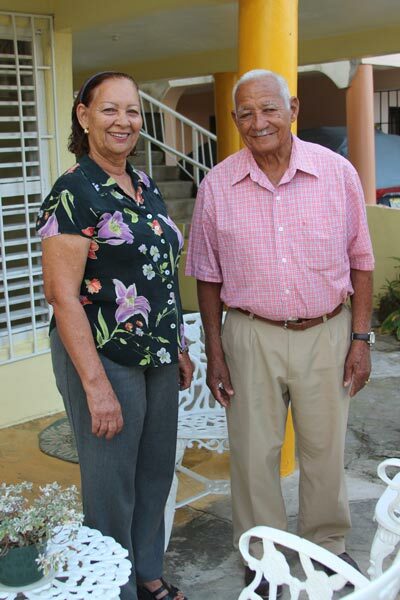 Every time Aristides brought us out to Maguaca, he could never just drop us off, but had to sit down in Fina’s kitchen for a bit of coffee, to discuss the news, to laugh about things described in their regional accent that I had trouble understanding, but thoroughly enjoyed. I loved witnessing the familiarity that comes from living one’s life in the same place, surrounded by the same friends, and by one’s family. If our time in Cotui was at all typical, Aristides and Fina see each other every day, and maybe even several times a day. It reminded me of college, the way you would swing by your friends’ dorm rooms and hang out, no matter the hour. And I thought that it’s no surprise that for many people, those times are recalled with great fondness. Now, having been raised in a place where my mother’s family has lived since 1717, and my father’s family has lived since the 1730’s, I understand the dangers of insularity, and the potential boredom of living in the same place all of one’s life. I was given the gift of community that most Americans nowadays cannot find, and I left that community, for too many reasons to share here. I started the hard work of building a community eight hours north, amidst the maples and the snow. My wife’s family lives a 15-minute drive away, and every time we go into the South Royalton Market, we run into someone we know. But I understand with some sadness that I’m going to live out my life being somewhat dislocated, the way most North Americans are dislocated, and the way even Gambo and Fina’s children have chosen to move away from Maguaca, to Santo Domingo, and to Barcelona. Fina made it clear that Maguaca is not what it was 40 years ago. Motorcycles and cars roared up and down the road at all times, and the colmado started playing bachata music a half-hour after mass ended. I struggled to string together five hours of sleep each night, and Tom and I eventually moved into Cotui for the final two nights, to avoid the hassle of the morning and evening rides to Maguaca, to be closer to where the other members of our group stayed, and to have the chance for quieter nights. When we bid Fina and Gambo farewell on Sunday, she said that we should consider their place our home whenever we return. And I will, despite the music and traffic noise. I consider myself blessed to have witnessed their marriage, to talk in the mornings, to learn about their lives, and to feel just the tiniest bit envious. I’ve read every word so far and am living vicariously through you all. Or as much as I possibly can imagine to. Thanks, Ryan, for this escape! Great writing, Ryan. Your thoughts on the culture and your experiences there are so near mine, having just returned form Guatemala last night at 11:45, happy and needing sleep.